Evolutionary changes in a-Si production yield big claims in efficiency and cost. Oerlikon Solar remains committed to amorphous silicon (a-Si) solar technology and, to that end, is promising improved efficiency trends and improved cost numbers. Despite the demise of Applied Materials' SunFab a-Si business, Oerlikon clearly believes there's a future for the oft pilloried a-Si photovoltaic technology -- and the firm continues to make aggressive cost and performance claims. Better scribing reduces "dead zones"
According to Oerlikon's Chris O'Brien, these advances will put Oerlikon into a cost leadership position in PV. O'Brien made the bold promise of 50 Euro cents per watt ($0.64 per watt) product cost and 10 percent efficiency by the end of this year. The Swiss-based, Russian-owned industrial group also announced an 11.9 percent stabilized efficiency hero experiment in partnership with Corning, using a new solar glass. This achievement, according to O'Brien indicates that "there's more room to grow in thin film silicon." O'Brien also said, "One of the things not yet fully recognized is the performance of thin film in higher energy delivery -- providing a 9 to 11 percent greater energy harvest because of temperature coefficient -- especially in the sunbelt." The company claimed that their ThinFab reduces the energy payback-time of thin film silicon modules below one year, with the lowest energy consumption for photovoltaic production plants in the industry. Although First Solar claims an Energy Payback Time (EPBT) of .8 years (EPBT includes manufacturing and installation). There are other players in a-Si -- Sharp is absolutely committed to a-Si, Astroenergy in China is working on a-Si, and we just heard from a stealth startup, also working in a-Si, that is boasting efficiency potentials in the low teens. Oerlikon continues to make aggressive promises regarding their technology. 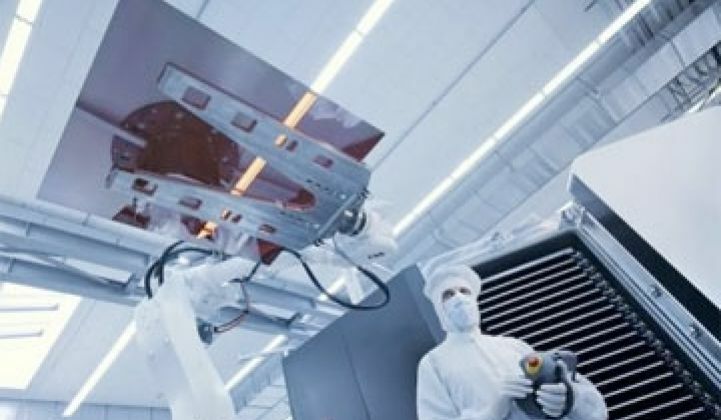 Now, Oerlikon has to make good on their performance and cost pledges or their customers and their fabrication equipment business could suffer the same fate as Applied Materials SunFab.